Last month we took a look at our biochemicals data and highlighted the top selling products in the global market, and looked at changing trends. Today we’re taking another look at our biochemical data, but this time we’re focusing on those products that are currently getting fewer citations but are showing an upward trajectory – making them the products to keep an eye on – the future stars of biochemical catalogues if you will. We spoke to CiteAb product manager Rebecca about this data, and whether it was possible to spot emerging biochemical products. Rebecca tells us: “From today’s data, we can pull out a few insights that could be very interesting to companies that currently don’t operate within the biochemical market but would like to develop a future pipeline opportunity. “For example, we’re able to highlight products for which there were no citations prior to 2012, but have since seen an increase year on year. The first product we’ve identified is Dabrafenib, which has seen increased year on year citations between its first in 2014 through to our data for 2017. Most of the citations for this product are from Selleck Chemicals with 83 per cent, with the remaining citations coming from Abmole. Rebecca explains: “This biochemical is a selective inhibitor of B-raf protein and in 2013 it was approved to treat advanced malignant melanoma positive for BRAF mutations. The citations we have for this product come from papers looking at BRAF mutations and B-Raf inhibitors in melanoma, and other cancers, such as colorectal. The second product Rebecca has identified is (5E)-7-Oxozeaenol, which has also shown an increase in citations the past few years. The majority, a whopping 92 per cent, have been from Tocris, with the rest from Santa Cruz. 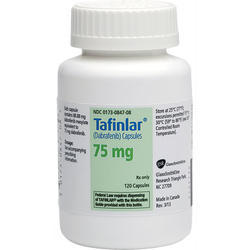 Rebecca states: This biochemical is a selective TAK1 MAPKKK inhibitor, and has been shown to reduce levels of pro-inflammatory cytokines by inhibiting TAK1. The use of this biochemical as seen in research papers links it to cancer research, neuroscience, and immunology. Every few months we send out an email to our followers with free data that you can use to gain insights into the global life science market and to make business decisions – to be sure of receiving your free data sign up using the form below today. If you’d like to discuss the full biochemical dataset with Rebecca please contact her to do so.